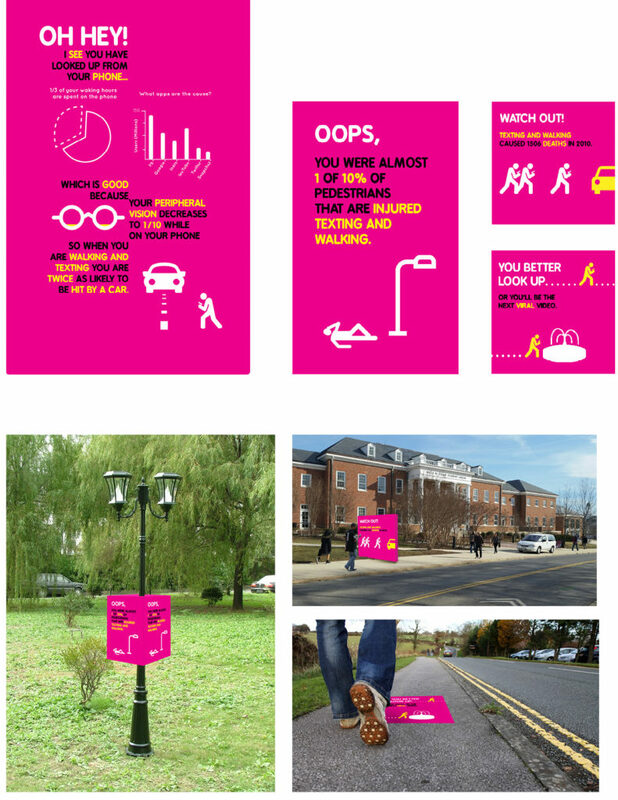 The Texting and Walking campaign is a bright, colorful, and humorous campaign, that is meant to get viewers off their phones playfully. The bright pink color is loud with the purpose of catching the eye of those on their phones, walking by. There are three different elements that are placed throughout public. The first is a large wall that interrupts a persons path. The second it a sticker that is meant to be pasted on the pavement, to catch the eye of someone looking down. The third is a padded wrap that goes around light posts to humorously help you from hurting yourself, had you run into the pole while texting and walking. Each has a statistic or tidbit that will hopefully raise awareness of the dangers of texting and walking. This campaign is also paired with a time use app that fights the problem from the source.